Below is Justin Taylor’s post today on “thegospelcoalition” website. I heartily encourage you to seek the Lord in the Word, and if you do, you will find him. Enjoy! Do you want to read the whole Bible? But the point is not merely to read the whole thing to say you’ve done it or to check it off a list. The Bible itself never commands that we read the Bible through in a year. What is commends is knowing the whole counsel of God (Acts 20:27) and meditating or storing or ruminating upon God’s self-disclosure to us in written form (Deut. 6:7; 32:46; Ps. 119:11, 15, 23, 93, 99; 143:5). But a simple resolution to do this is often an insufficient. Most of us need a more proactive plan. Stephen Witmer explains the weaknesses of typical plans and offers some advice on reading the Bible together with others—as well as offering his own new two-year plan. (“In my opinion, it is better to read the whole Bible through carefully one time in two years than hastily in one year.”) His plan has you read through one book of the Bible at a time (along with a daily reading from the Psalms or Proverbs). At the end of two years you will have read through the Psalms and Proverbs four times and the rest of the Bible once. The Gospel Coalition’s For the Love of God Blog (which you can subscribe to via email, but is now also available as a free app) takes you through the M’Cheyne reading plan, with a meditation each day by D. A. Carson related to one of the readings. 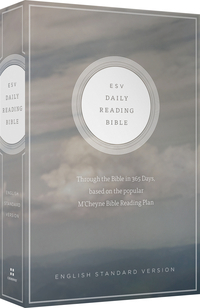 M’Cheyne’s plan has you read shorter selections from four different places in the Bible each day. Trent Hunter’s “The Bible-Eater Plan” is an innovative new approach that has you reading whole chapters, along with quarterly attention to specific books. The plan especially highlights OT chapters that are crucial to the storyline of Scripture and redemptive fulfillment in Christ. This entry was posted in Uncategorized and tagged The Bible by ivanjamestruman. Bookmark the permalink.